The Jungheinrich EJG 212-214-216 is a pedestrian controlled truck which can be used wherever support arm stacker trucks cannot operate, e.g. sideways lifting of pallets, special load sizes, racking with collision protection. With an overall width of 910 mm and a high degree of manoeuvrability, it can also be operated with ease in confined warehouse areas. Above all, the EJG 212 offers a very short front dimension. 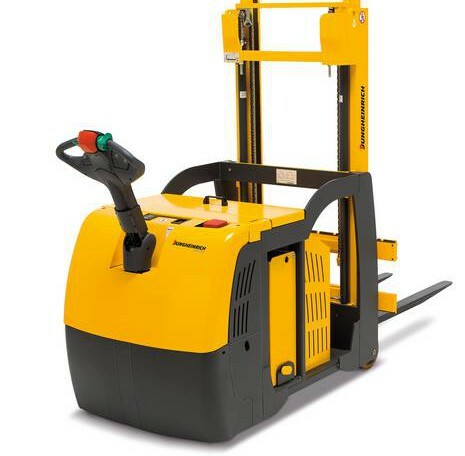 In pedestrian mode, the EJG can be operated without a driver’s licence and is therefore suitable for applications where personnel change frequently. The EJG 212-214-216 draws its energy from batteries with capacities of up to 375 Ah. Battery compartments for lateral battery exchange are available for multi-shift operations (optional). A built-in charger (optional) ensures comfortable and reliable charging at any standard 240-V mains socket. The cantilever design without interference from support arms also allows the transport of sideways pallets or special load carriers. The generous ground clearance with 200 mm load wheels also allows the truck to travel over uneven ground and low thresholds. The short overall length makes manoeuvring easier in confined areas. Batteries 3 EPzS 375 Ah.